Today's post is just a quick one to show some late night nail art I did! For this design, I used mostly LVX polishes and Born Pretty Store products. Starting with the base, I applied China Glaze Street Chic and sponged LVX Greige over it. I then used a combination of Greige, Citrine, and Ecru to get the desired look of old textured paper. Next, I used Born Pretty Store's Super Matte Top Coat to mattify the colors. For the details, I used black acrylic paint with a BPS nail art brush. I also applied a black MASH rhinestone to the center of the compass. For the "X" I used Born Pretty Store's red glitter sheets. Oh wow, this is great!!! This is such an awesome idea. Love the execution and the glitter on the X.
I love this! The red x is simply perfect. This makes me want to go treasure hunting! This is SO cool Christa, I love it. Wow, love it! Very original and well executed :). Oh my freaking god! These are so so cute! Hi Christa! 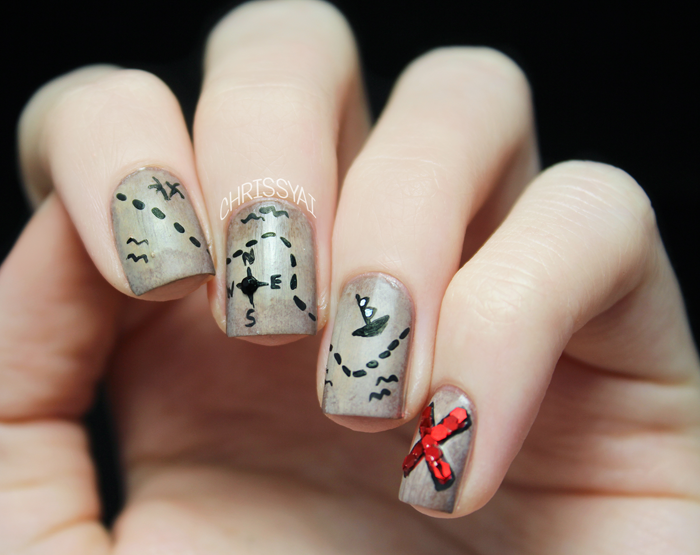 I just wanted to let you know, I found this mani on a Google search, and it served as inspiration for a treasure map mani I just did for a challenge group I'm in. I wanted to let you know that I posted this photo to show my inspiration, but I gave full credit and clearly stated that this is a photo of YOUR mani, not mine. Hope this is okay! Beautiful design, thanks for sharing! I think this nail art idea will perfectly a pirate costume that some of you might want to wear this Halloween.